To inquire about open positions or to apply, visit UNCW Human Resources, or contact Lt. James Watkins, Professional Standards Unit, watkinsj@uncw.edu. 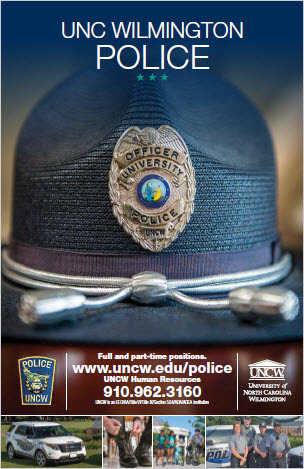 UNCW police officers are primarily responsible for implementing a community policing model to advance the strategic goals and priorities of the University. Officers are required: to work closely with individuals and groups within the University community for the purpose of maintaining an atmosphere that supports quality campus life and reduces crime-related risks and vulnerabilities on the campus; to conduct high visibility patrol of campus buildings, grounds, roadways, and parking facilities; to respond to calls for service; to enforce University policies and state laws; demonstrate excellent communication and decision making skills in the delivery of police services; to render services unrelated to enforcement, including, but not limited to building security and educational programming. Police officers participate in the NC Teachers' and State Employees' Retirement Program for State Law Enforcement Officers and are vested after 5 years. Police officers qualify for federal and state law enforcement life insurance benefits. UNCW contributes 5% of salary to a personal 401(K) account. Officers may be eligible for a special two year salary continuation if injured on duty. After probation, employees are eligible to attend one UNCW academic class per semester at no cost. UNCW provides access to state of the art workout and exercise facilities and opportunity to enjoy UNCW sports events. The UNCW athletic teams participate in Division I of the NCAA. 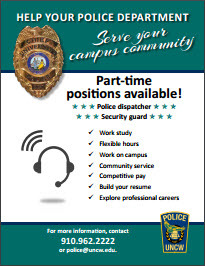 The University Police Department employs full and part-time security guards throughout the year. These individuals support the police department's security function and require the wearing of a uniform. Responsibilities include: conducting high visibility foot patrols of buildings and grounds; controlling access to certain areas; intervening in suspicious circumstances; locking and unlocking facilities; responding to calls for service including fire and medical emergencies; observing and reporting conditions, such as equipment that is out of order, vandalism, fire hazards, and violations of state laws and university regulations (including parking regulations), that require the attention of other University officials, such as police officers and maintenance personnel; responding to alarms and initiating evacuation procedures; directing traffic; providing security escorts; and assisting individuals by providing directions and assisting stranded motorists who may have experienced a flat tire, dead battery, or locked their keys in their vehicle. Dayshifts and nightshifts may be available, work hours are flexible and can vary according to department need. Police telecommunicators staff the university communications center and perform technical communications work in support of public safety operations. This work involves receiving emergency and non-emergency calls, maintaining public safety communications logs and databases and interfacing with criminal justice information exchanges. Like other administrative staff within the university, these professionals provide support and oversight of procurement, budget and planning, equipment maintenance and readiness, inventory management, personnel and business functions, among many others. UNC Wilmington actively fosters a diverse and inclusive working and learning environment and is an equal opportunity employer. Qualified men and women from all racial, ethnic or other minority groups are strongly encouraged to apply.